The Department of Education Tagum City Division along with Tagum Water, a subsidiary of the Manila Water Company, were in charge of selecting the school recipients based on their need and number of enrollees. Present during the book turnover are (from L-R) Tagum Water Board of Directors Representative Alma Uy,RN, MBA, Department of Education Division of Tagum City Chief Education Supervisor and OIC Principal of Magugpo Pilot Central Elementary School Josefina Palaca, Ed.D, Magugpo Pilot Imelda Elementary School Principal Siony German, Manila Water Foundation Program Manager for Water Education Xavier Cruz, Magugpo Pilot Central Elementary School Master Teacher Esterlina Batingal, and Rizal Elementary School Principal Erlinda De Silva Quinto. More than 20,000 pupils from the Visayas and Mindanao regions now have access to a better and more balanced learning after the coming together of two organizations that share a vision of fostering an environment where children can get holistic education in full support of the Department of Education’s (DepEd) remarkable efforts to provide quality education for future nation builders. Each school year, public schools make sure that they are well prepared and equipped to welcome pupils for another 10 months of learning as they open their doors to more than 90% of the country’s student population. Remarkable improvements have been manifested over the years. However, there are matters that they cannot solve overnight. One of which is the insufficient amount of reference books and textbooks in schools. According to a 2015 United Nations Educational, Scientific and Cultural Organization (UNESCO) report, the government continuously increases the budget for education each year since 2010, to address this problem. DepEd also engages in private-public-partnerships (PPP) to further improve the situation. Before these efforts were pursued, Principal Erlinda De Silva Quinto of Rizal Elementary School in Tagum City shared how their pupils needed to share books to cope with their studies. To aid the situation, teachers search and download lessons from the Internet which they reproduce so that all pupils will have their own set of learning materials. “May grade level na hindi pa kumpleto [ang mga aklat kaya] nagre-research ang mga teacher. We reproduce kung ano yung nakukuha nila sa Internet para lahat ng bata magkaroon,” (“Some grade levels are lacking in books. Thus, the teachers download lessons from the Internet which they then reproduce so all pupils will have something to use for their studies.”) she explained. With DepEd’s guidance, neighboring schools in the city are also dedicated in overpowering the same dilemma. OIC Principal Josephine Palaca of Magugpo Pilot Central Elementary School and Principal Siony German of Magugpo Pilot Imelda Elementary School explained why the deficient supply of textbooks and reference books is crucial in molding young minds and the steps they do so that the pupils are not shortchanged. “Malaki talaga ang epekto ng kakulangan ng books. Kung kunwari magturo lang kami tapos walang follow up at walang materials na nababasa ang mga bata mahirap kasi hindi naman tayo pareho ng learning style,” (“The deficiency in books has a tremendous effect on the pupils’ learning. If we only give lectures and leave the kids with nothing to read, then some might have a hard time understanding the lessons due to differences in learning style.”) OIC Principal Palaca stressed. Fortunately, these schools were chosen to be some of the recipients of the books from MWF and Scholastic. A turnover of donation was held on June 24, 2016 at the DepEd office in Tagum City. Back in March, the books allotted for the province of Cebu were also turned over at the DepEd headquarters in the cities of Cebu and Danao. Said books are part of the pledge of Scholastic during the Foundation’s celebration of Global Handwashing Day in 2015 wherein the pupils of the recipient schools also participated in, as well as a reiteration of the MWF’s steadfast commitment to further DepEd’s laudable initiatives to continuously improve the country’s educational landscape. Various information, education, and communication (IEC) materials were also given in line with the Foundation’s advocacy to make proper handwashing a lifestyle, especially for children. advocacies of the Foundation during the book turnover. 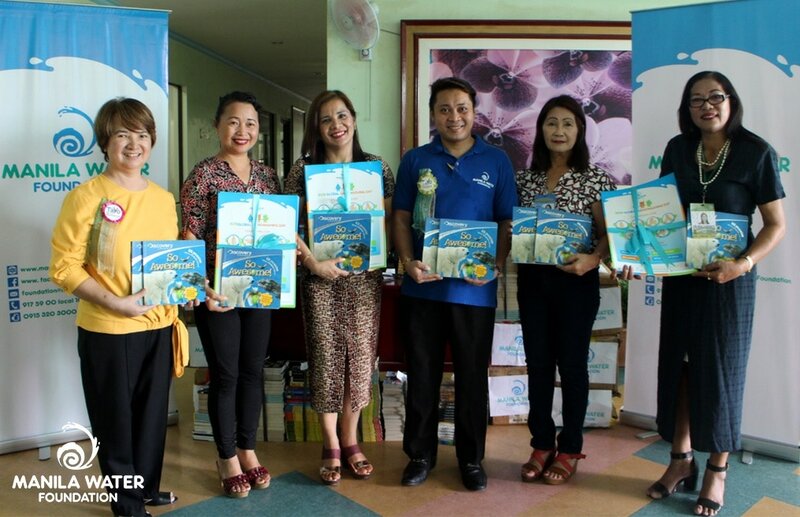 MWF Executive Director Carla May B. Kim spearheads the book donation turnover in Danao City. Officials from DepEd and the local government unit of Danao City together with principals and pupils of the school beneficiaries were also present during the turnover. Walang kupas ang aming pasasalamat. Grabe talaga ang biyaya na natanggap namin dahil ang mga aklat ay instrumento [para matuto ang mga kabataan sa aming paaralan],” (“We are very thankful. This is a huge blessing because these books are instruments for our pupils to learn.”) OIC Principal Palaca remarked with gratitude. “Maraming salamat po talaga for choosing us as one of the recipients. Sobrang natuwa kami, kasi meron pa palang mga taong ganito [na handang tumulong] kahit na ang layo namin,” (“Thank you for choosing us to be the recipient of the books. We are glad to know that there are organizations who are ready to help us even if we’re far from the city.”) Principal German gleefully stated. Principal Nida Jordan of Severo Duterte Memorial Elementary School in Danao City highlighted the importance of the book donation while expressing her gratitude. “We feel so blessed that we are one of the recipients of the books from Manila Water Foundation. The kids really enjoy reading and doing the activities in the books. Books are very important especially nowadays when there is a real need to keep the real love for reading because it will help the children improve their comprehensive skills,” she shared. The book donation has a good combination of reference, textbooks and storybooks. With this, Principal Quinto shared that their school can now start putting up a library where their pupils can read and learn. She also mentioned her intentions of promoting the value of reading books even now that the Internet and gadgets are almost available to all. ​“The books are still [relevant]. Kasi kapag walang kuryente paano? Di ka maka-access [lalo na at] palagi kaming may power interruption. (The books are still relevant especially since we always experience power interruptions.) [Thus], the school, the pupils and the community in general are very thankful that the Manila Water Foundation chose our school to be the recipient of the books for the use of the children. These books can help the children enrich their vocabulary and travel [through] reading,” she stated. Rizal Elementary School Principal Erlinda De Silva Quinto shares her plan to use the donated books in putting up a library in their school during an interview.